More of an FYI, but the EU Cookie Consent law goes into effect on Oct 1. Maybe this matters to you, maybe not. In my case, I may be in limbo as I work for a UK company even though I live in the US. Certainly I want EU visitors to my sites, so I decided to go ahead and comply. I choose Cookie Consent and added it to the site. The default activation is at the top of the site, and that’s fine. I tested this with a Private browser window and I see the notice. I’m not going to mess with options here, just let you know there are cookies. 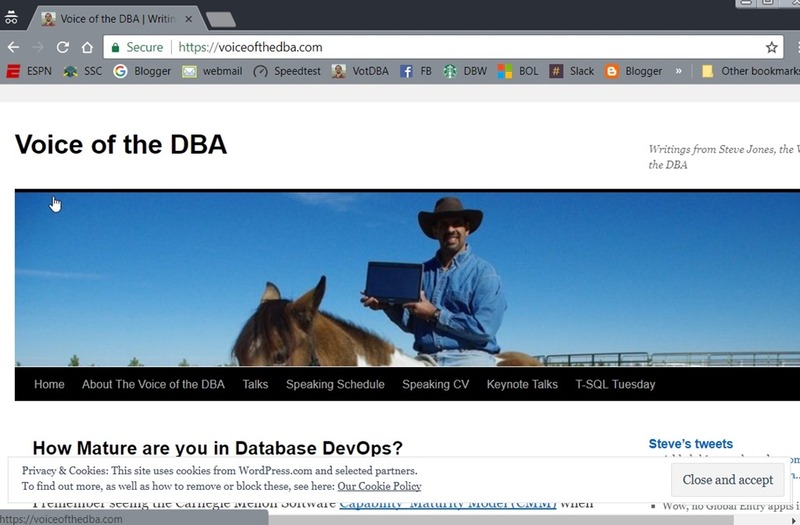 For voiceofthedba.com, this is hosted by wordpress.org. I did that since it was easy and I don’t need to manage WP for the blog. Here, I went to the Appearance menu and then Widgets. In this section, WordPress have provided the EU Cookie Law Banner. That’s fine with me, and I added it to the First Footer Widget area. Again, not messing with settings, and I confirm this is at the bottom of the page. Whatever you think of this law, I decided compliance was easy and not a big deal. I’ve been seeing this on more and more sites, so it may be just something to get used to. Up to you, but I’d add this to my blogs if I were you.